Alex, an unemployed actor, works in the basement mall of an enchanting celebrity home in the hills of Malibu. There, the grass is Irish golf course green, the fish in the pond swim happily but not too fast, and the leaves on the trees shimmer like sequins on Liza Minnelli. Buyer & Cellar is a seriously funny slice of absurdist whimsy about the price of fame, the cost of things, and the oddest of odd jobs. 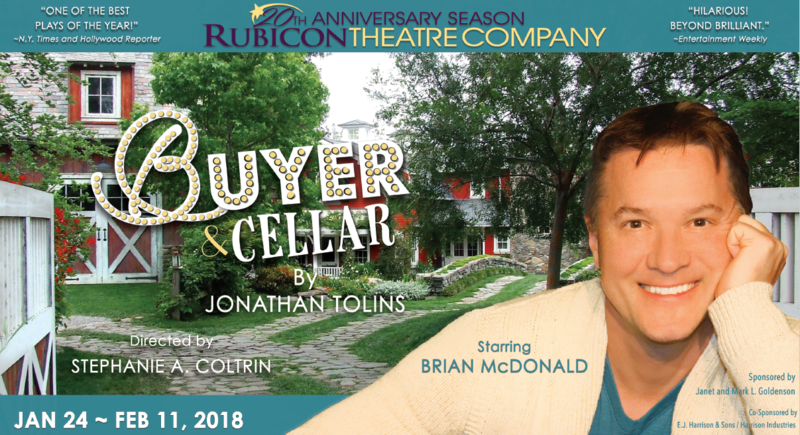 Rubicon Resident Artist Stephanie A. Coltrin directs Brian McDonald in this irresistible one-person comedy. Opens Jan. 24 and runs through Feb. 11. For tickets call 805.667.2900 or rubicontheatre.org. Rubicon Theatre Company is located in the cultural district of downtown Ventura on 1006 E. Main Street. Follow us on Facebook: www.facebook.com/rubicontheatre or on Twitter @RubiconTheatre.